The NAFEM Show kicked off Thursday with more than 20,000 attendees descending on the Orange County Convention Center in Orlando, Fla., to examine the latest game-changing restaurant equipment produced by 600 companies. Standouts at the show, produced every other year by the North American Association of Food Equipment Manufacturers of Chicago, were companies with ground-breaking appliances and equipment designed to make restaurants more efficient in labor, operations and training. NAFEM highlighted several “must see” products in four lounge booths labeled “What’s Hot! What’s Cool! What Works!” The products on display were selected because they made positive impacts for operators ranging from national quick-service chains to convenience stores and college commissaries. Ventura Flex Tabletop Corn Tortilla Machine: Texas-based Tortilla Masters Equipment LLC has developed a machine that can crank out 840 corn tortillas an hour. The machine has been snapped up by a taco shop inside Facebook’s California headquarters, a Mexican eatery at The Venetian Resort hotel and casino in Las Vegas, Nev., and a handful of Pure Taqueria restaurants in Georgia, company representative Leticia Alatorre said. The Las Vegas restaurant, Cañonita Restaurant, achieved full return on investment on the product after two months. The restaurant said it saved 56 hours of labor a week. Companion Cart Portable Cleaning System: Stoelting developed the Companion Cart for Generation Next, a San Diego, Calif.-based company that franchises automated frozen yogurt vending machines. The company needed a way to clean the vending machines because the owners did not have direct access to plumbing facilities. Stoelting’s portable cart reduced cleaning time by 66 percent, because it requires fewer steps to clean the machines, the company said. “Not only does cleaning take less time, but the modular cart is easy to pack and go — an ideal solution for our operators with vending machine kiosks in multiple locations,” said Nik Wright, Generation Next vice president of operations, in a statement. 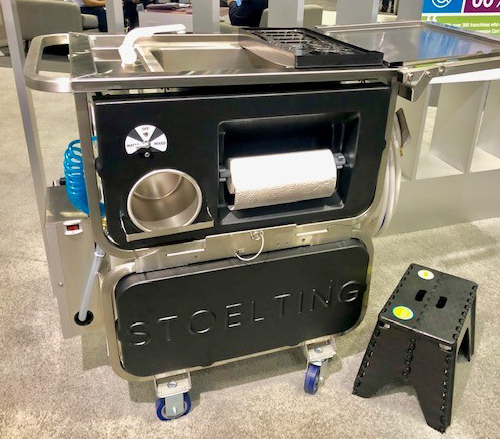 Stoelting, whose parent company is The Vollrath Co. in Wisconsin, said the cart’s streamlined steps also require less training. It also reduces water waste. Other operators adopting the portable cleaning system include Dairy Queen and Menchie's Frozen Yogurt. Vector F Series Multi-Cook Oven: Wisconsin-based Alto-Shaam Inc. created a multi-functional oven that can cook a variety of items at different temperatures — such as cookies and salmon — with no flavor transfer. The F Series Multi-Cook Oven was designed for Alabama-based WJP Restaurant Group, which was challenged by frequent turnover in the kitchen and meeting capacity demands at its restaurants. The multi-cook ovens can do the job of seven convection ovens, which reduces labor costs and improves production. “Even if someone [in the kitchen] calls in sick, we don’t have to worry because the oven is easy enough for everyone on staff to use,” said Michael Northern, WJP vice president, said statement. FlexPro Burger Smasher: AccuTemp Products Inc. based in Fort Wayne, Ind., customized a burger smasher for Dog Haus, a fast-casual burger and hot dog chain based in Pasadena, Calif.
Cooks at the chain, which is growing through franchising, were stressing out and experiencing wrist pain due to the demand of manually pressing each burger one at a time on the grill, said John Pennington, AccuTemp corporate chef. “They were having trouble keeping cooks,” he said. With the FlexPro Burger Smasher, Dog Haus cooks can now make eight burgers at a time. The smasher reduced employee stress, increased production by 20 percent and reduced cook times by 15 percent. “The biggest compliment we could have received was from a cook who’s been with Dog Haus since the beginning. He thanked us for making his job easier and less stressful,” said Hagop Giragossian, Dog Haus partner, said in a testimonial.